The announcement for Arik Levy: Intimate Formations, the inaugural exhibition at Please Do Not Enter that just opened in Downtown Los Angeles, reads Levy is an “artist, technician, photographer, designer, video artist.” The multidisciplinary list begs the question: How does anyone operate across so many practices? Does Levy flip a switch from “designer” when he’s working on furniture, lighting, and interiors, to “artist” when he’s working on sculptures and paintings? “I separate them,” Levy said, taking a moment to talk amid artwork and wooden crates in various stages of unpacking and installation. “When I make a chair, I make a chair. When I make a sculpture, I make a sculpture.” The distinction between these disciplines is apparent to him, and it’s a defining characteristic of how he identifies his practice.“I don’t know many other people who operate or work this way,” he said. “But one enriches the other. But when I make a painting I know it’s not graphic design, and when I make a logo I don’t pretend to make a painting. So I’m not here or there.” His first West Coast solo exhibition, Intimate Formations, installed at the small gallery and storefront in Downtown Los Angeles is comprised of 25 works, including freestanding and wall-mounted pieces, large-scale sculptures, neon sculptures, and paintings. 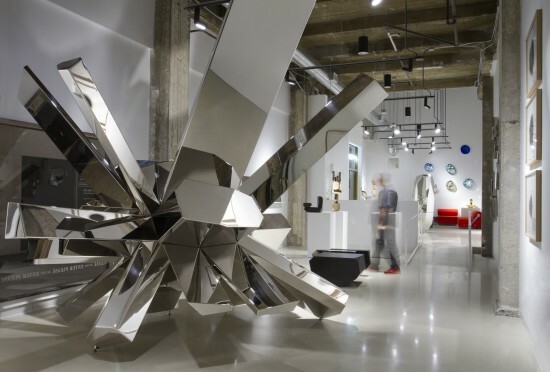 Born in Israel, trained as an industrial designer in Switzerland, and operating out of Paris, Levy said the works on view, which make use of reflective surfaces and abstracted geometrical structures, emerge from an exploration of social sciences, genetic sciences, and biology. Still, Levy acknowledges that his background in design plays a role in the formal outcomes of his work. “The culture of design has brought a lot of perfection into the artwork because I understand engineering,” he said. “I understand packing. 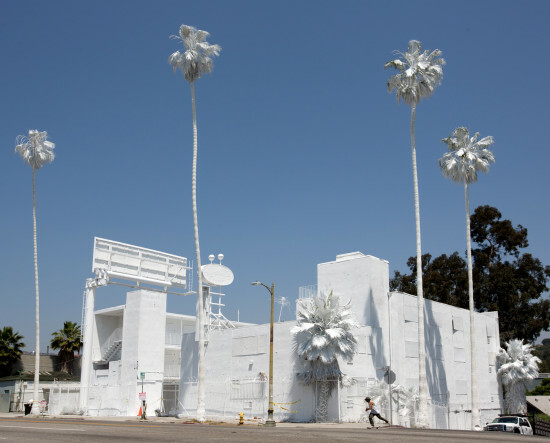 I understand logistics.” Coming off the flurry of attention that Please Do Not Enter generated last month when it presented Vincent Lamouroux’s seemingly made-for-social-media installation, Projection, which covered a vacant Sunset Boulevard motel in a whitewash of lime, Intimate Formations continues the discussion about the spaces that mediate art’s interaction with the public. If Lamouroux’s Projection was about bringing a gallery experience outdoors, Intimate Formations is exactly the opposite. “We brought what is almost a public art piece inside the gallery, inside a closed space,” said gallery co-founder Nicolas Libert, discussing how large-scale outdoor work from Levy’s RockGrowth series found its way into a small new storefront space on Olive Street across from Pershing Square. Inside the gallery, Levy’s pieces take on architectural ideas: transparency, framing, and the thresholds between interior and exterior. “These reflecting pieces play with the surroundings, and reveals what’s around,” Libert said about Levy’s work. "It’s amazing for people to interact with the artworks.” For Levy, the public’s reaction to the work is another opportunity to draw a distinction between his practice as a designer and his practice as an artist. “In contrary to the design business, in art, I don’t know if a piece will be or will not be successful,” he said. “Will it be appreciated intellectually, emotionally, or will somebody buy it?” “It’s all unknown.” Arik Levy: Intimate Formations is on view through July 11, 2015 at Please Do Not Enter, 549 South Olive Street, Los Angeles.